If you looking for some naughty fun this weekend you might want to try out this wacky piece of big-screen chortle… provided you can bear with the brainless bacchanalia sheathed in a sexual innocence that the protagonists are able to convey without straining at their collecting leash. For a film about family planning and vasectomy there is a remarkable absence of vulgarity and double meaning in the conversations. The characters speak to each other loudly and irrelevantly. They don’t know any better. Sunny and Bobby Deol are in the fun zone doing lowbrow comedy with disarming relish. 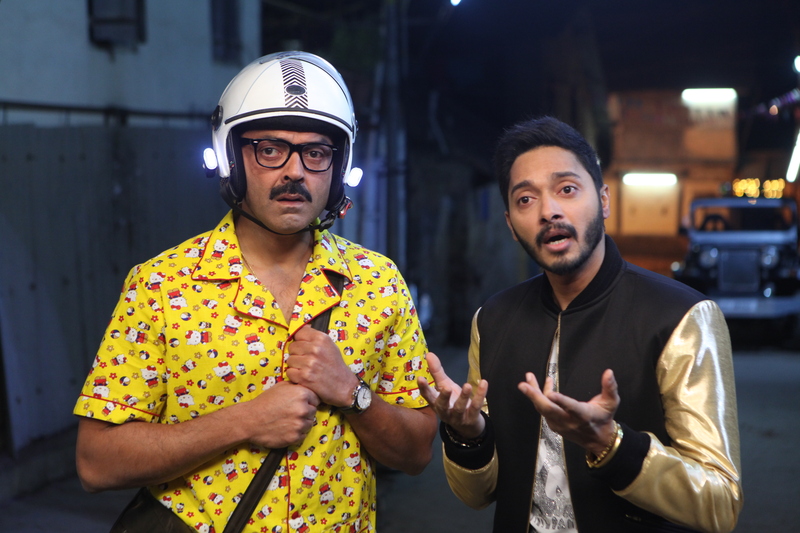 Shreyas Talpade, with his redoubtable comic timing, joins the Deol brothers. The result is boisterous humour, not all of it funny or even coherent, I am afraid. In fact some of the gags overstay their welcome like bin bulaye mehmaan. In his capacity of director Shreyas Talpade keeps the proceedings on a heightened chug. No one is pretending to make a durable comedy like Jaane Bhi Do Yaaron or Chupke Chupke here. There is just that much of self-mockery including a lot of Dharmendra-Sunny Deol jokes, none of meant to belittle the film’s message that a man doesn’t lose his mardaangi by undergoing a vasectomy. The journey into that domain of self-awareness is carried out by the three main actors with charming gusto. Barring the ever-dependable Ashwini Kalsekar who is a hoot as a zonked-out doctor the other female characters are screaming nags, hissing naagins, suspicious wives and jealous girlfriends. Even the veteran Bharti Achrekar’s cameo as a blind rustic shooter looked so contrived it could be something the scriptwriters wrote in as an afterthought. Subtlety is at a low premium in this one. But the film has no pretensions of being anything intellectually inclined. The message on family planning is subservient to the comic timing of the three protagonists. Sunny, Bobby and Shreyas are a laugh riot. And some of their encounters with red tapism bureaucracy and legalese will have you chuckling. But as warned, don’t look for signs of creative spark here. Poster Boyz is wickedly unpretentious about its intentions. Unabashedly liberated from the responsibilities of wrapping their message in gravity, the cast has fun. So do we. At least for some of the way. Until our trio of heroes decides to take off their shirts in public to protest against the injustice done to them. This barebacked hullabaloo(referred to rather ambitiously as ‘nanga andolan’) is for some curious reason, fodder for breaking news in the plot. No wonder the highly regarded Sachin Khedkar who spears in the climax as the Chief Minister looks more befuddled than amused. By the end of it Poster Boyz has milked its one-point family-planning programme to the utmost. But no one will home hungry. This is Indra Kumar’s Masti without the sleaze. Vasectomy without penile jokes. 15 queries in 0.918 seconds.